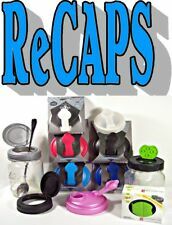 ReCAP Lids, FLIP CAPS, SHAKERS & Gaskets For Mason Jars, BPA FREE! Transform any Mason Jar into a drink tumbler with the Jarware Drink Lid. The lid fits regular mouth Mason Jars and is recommended for use with 16oz size jars. BPA free and dishwasher safe! Mason Jar and metal ring are not included with purchase. 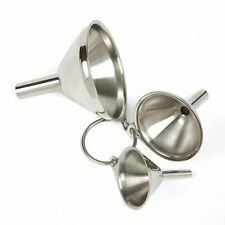 Norpro's 3 piece stainless steel small funnels are ideal for fitting small bottles and containers. They fit perfectly in the ball plastic jar lids and don't fall out. Custom-designed round labels fit a variety of spice jars and bottles. The clear background means the 1.25" diameter labels are easy to read and the curved black lettering makes them ideal for lids. Set of 50 with 45 pre-printed spices and herbs and five blanks. 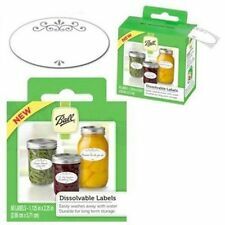 Fun and festive, the RSVP Canning Label set was designed for use on jam and jelly jars, canning jars, oil and vinegar bottles, cookie tins, and paper-wrapped gifts. The colorful assortment of designs suit any occasion, from birthdays and anniversaries, to Christmas and seasonal holidays. Prepworks Canning Funnel was designed to keep jar rims and counters mess-free. The outer funnel edge fits securely over the top of both wide and regular mouth jars, measuring 5 inches in diameter and 3.25 inches in height. Constructed of Polypropylene, the Prepworks funnel is dishwasher safe. The sealer is equipped (default) to seal a standard No. 2 food can. Take a load off your arms! We are an Authorized dealer and follow the minimum advertised price policy of the manufacturer. Wide Mouth Size. Ideal for freezer jam. 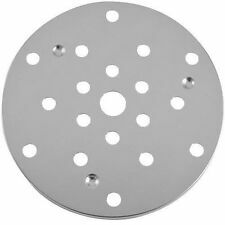 Made from Dishwasher Safe precision pierced 18/8 stainless steel. Great for canning, cooking, frying, serving and more. Dishwasher safe. RSVP ENDURANCE STAINLESS STEEL PIERCED STRAINING SPOON. Great for serving, skimming, straining, & canning. Ball regular mouth 4 Oz Quilted Crystal jelly jars are ideal for fresh preserving recipes such as jams, jellies, sauces, mustards and flavored vinegars. The quilted design is popular for gift giving and crafting. Designed to allow removal of any size canning jar from boiling water. Regular size. We just want you to be aware of this! •Use with the following size jars: 4 oz (jelly), 8 oz (jelly),12 oz (jelly), 1/2 pt, Pint, Quart. REINVENT YOUR MASON JARS! This lid provides and air tight, dependable seal to keep your foods fresh and ensure that it will never leak. DEPENDABLE, LOW EFFORT SEALING. The ingenious seal design reduces friction between the jar and the lid so that the lid can be removed easily. HONEY DIPPER. Fits regular mouth mason jars. Mason Jar NOT included. 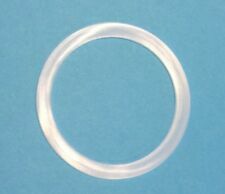 Presto 09909 Pressure Cooker / Canner Sealing Ring. The sealing ring fits around the inside rim of the cover and forms a pressure-tight seal between the cover and the body of the pressure canner during canning and cooking. Harold'S Kitchen Canning Funnel Stainless Steel 2-1/4"
They're a great addition to kitchen accessories. Quickly change, fill or refill contents for easier food preparation. Refill canisters, dispensers and food storage containers with bulk foods, like sugar, flour, rice, grains and other dry goods. These types of bacteria grow best in air tight containers—ones where undesirable types of bacteria—including mold and yeast—cannot thrive. Made from high quality lead free, mold free, and BPA free pure soda glass. ★ FITS ANY WIDE-MOUTH MASON JAR — With a size of 3.35" diam, each lid is perfectly suitable for all wide mouth mason jars. 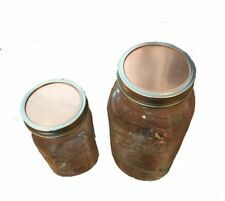 ★ Fits Any Wide Mouth Mason Jar — With a size of 3.35’’ diam, each lid is perfectly suitable for all wide mouth mason jars. Set Of 3 Regular Mouth Kits. Make your own live super foods. does not include jars. Make Live Foods. Made from high quality lead free, mold free, and BPA free pure soda glass. Better than ceramic weights. Bacteria cannot hind in non-porous solid glass. Easy to remove weight. Stick butter knife on the side and lift. The sealer is equipped (default) to seal a standard No. 2 food can. To operate, place a can on the baseplate and then place the lid on the can. A turn of the lever lifts the can into the chuck. · Nakpunar brand 12, 8 oz. mason jars with 12, silver Mason jar lids · High quality led free glass jars comes with BPA free plastisol lined airtight, leak-proof lids. · 2.5" wide 4" high. Can be used to hot bath. · Smooth sides perfect to put customized labels on it for parties, to fill with your homemade jellies, cook pie in them, to give as wedding and party favors. 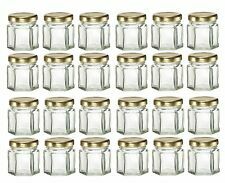 · We also offer same jars with 12 different lids option. For the replacement lids please search “Nakpunar Mason Jar Lids". Coordinated with " Nakpunar 4" Honey Dippers, Nakpunar Fabric Jar Covers, Nakpunar jar labels. Great for Wedding, Baby Shower Favors, Baby Food Storage, to make Magnetic Spice Jars. We will try our best to reply as soon as we can. 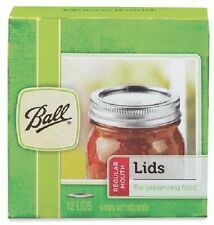 Up for your consideration are 50 New Red Ball mason canning jar lids / flats regular mouth unboxed. This is for the lids ONLY! I hope this doesn't bother anyone. Jars fit your reusable Kilner preserve jars. For the following Kilner storage jars: Ace nos. 6268643 (12 oz. )., 6268668 (17 oz. )., 6268676 (34 oz. round jar), 6268718 (34 oz. square jar), 6268734 (68 oz.). The sealer is equipped (default) to seal No. 10 & No. 12 food cans. flywheel makes sealing cans easier than with a hand crank (18 revolutions per can). To operate, place a can on the baseplate and a lid on the can. Regular Mouth Size. Ideal for freezer jam. Check out our full line of Jarware Mason Jar Repurposing Lids here! Fresh squeezed OJ you say?. Juice away, remove the lid and drink from the jar! Fits wide mouth mason jars and installs quick and easy under the jar band. 18 FLOWER Floral Write-On Canning Labels Party stickers Mason Jar 2"– 2.5"
Nakpunar 24 pcs, 1.5 oz Mini Hexagon Glass Jars with White Plastisol Lined Lids. Coordinated with " Nakpunar 4" Honey Dippers, Nakpunar Fabric Jar Covers, Nakpunar jar labels. Great for Wedding, Baby Shower Favors, Baby Food Storage, to make Magnetic Spice Jars. Not intended for use with wide mouth jars. White Plastic Regular Mouth Mason Jar Plastic Lids-24 Lids. Sanitary white plastic lids with liners for standard size mason jars. The ball FreshTech electric water bath Canner is designed to free up your stovetop for canning or cooking. Its large 21-quart capacity replaces most standard water bath models. It's ideal for all high-acid recipes, such as jams, jellies, pickles, salsas, tomatoes, fruits and more. Transform your mason jar into a drinking glass with this nifty Fox Run Jarware Wide Mouth Drink Lid! The durable plastic is BPA-free and dishwasher-safe for your convenience. From iced tea to lemonade, easily drink from a mason jar with the help of your new Fox Run Jarware Wide Mouth Drink Lid! Arrow Vented Canning Funnel, for Jars Jams, Salsas, Vegetables, Etc. Its large opening makes transfer of fruits and vegetable easy and the venting creates faster flow. Its great details will make your canning more delicious and efficient. Large opening for transferring food into jars. 6 pieces 8 oz Mason Glass Jars with Gold Lids 2.5" wide x 4" high Great for cooking pie in them, Wedding, Baby Shower Favors, Baby Food Storage, Spice Jars You can fill them with honey, jam, candies, beads, buttons, body butters, oils Replacement lids available in colors with buttons for canning (red and gold), without buttons, with daisy cuts: http://www.amazon.com/dp/B0196FEZR8. Safely remove canning lids from boiling water using this convenient magnetic lid wand! Made of durable, heavy duty magnets, this lid wand picks up one lid at a time, helping to keep your canning lids sterilized. An essential tool for home canning enthusiasts! Measures 7in/18cm. Hand washing recommended.